Some Apple Watch users have reported that they are suffering from skin irritation upon wearing the sophisticated piece of smartwatch. Apple released this smartwatch in April this year at a whopping price. The smartwatch of Apple went so over-hyped that it received as many as 1 million pre-orders much before its release. The features, colors and variants as arranged by Apple curved a niche for Apple Watch to become a quintessential smartwatch. But now several users have reported complaints of skin irritation against it. 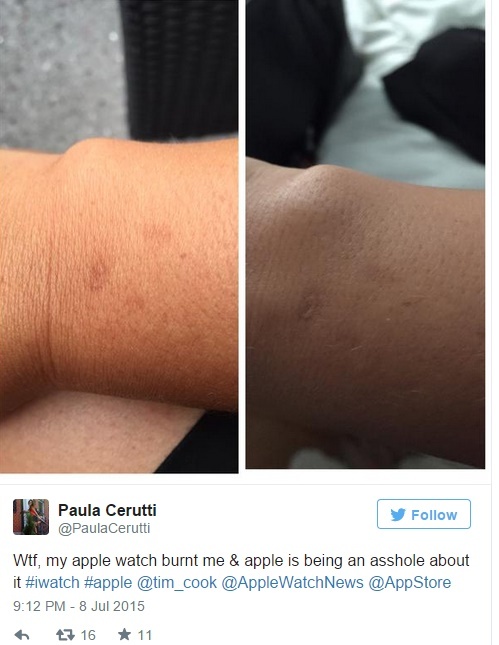 Several users twitted images of their burnt skin which that allege to be a result of the Apple Watch they wear. A Twitter user Paula Cerutti twitted the picture above, mentioning that during her workout, she started having a burning feeling on her wrist. The same wrist in which she was wearing the watch. The strap of the Watch was tightened and when she loosened the strap, she found tiny blisters formed on her wrist. Many other users have also made similar allegations against Apple Watch. Andrew Terry, another Twitter user has also suffered from skin burns and blisters. 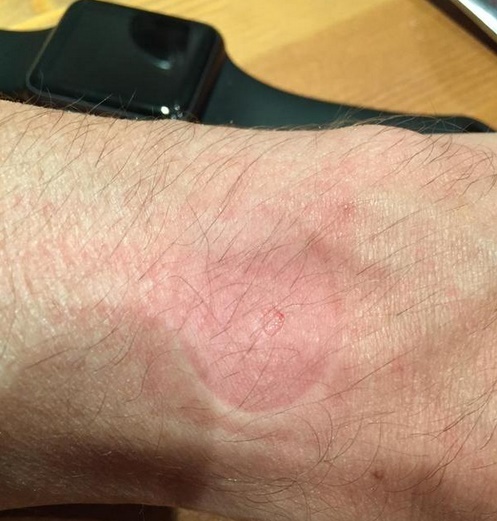 It is still unclear if the irritation has occurred due to radiations from the Apple Watch or just because of friction produced by the rubber strap of the said wearable.